In this tutorial, we will show you how to use message highlighting in SquirrelMail. This can help organize your Inbox by automatically displaying emails in specific colors. 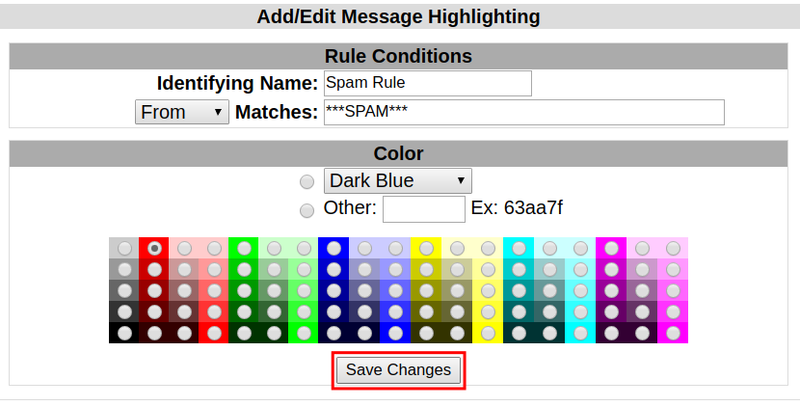 In our example, we will create a rule to highlight any email in red that has "***SPAM***" in the subject line. Click the Message Highlighting link. Click the Add link to create a message highlighting rule. Give the rule a name in the Identifying Name section. Click the drop-down box and choose from the following options: From, To, Cc, To or cc, and Subject. In my example, I am choosing Subject. In the Color section choose the color you want to higlight the emails with. Click the Save Changes button. Now any incoming emails that match your rule will be highlighted automatically. Congratulations, now you know how to use message highlighting in SquirrelMail!